Do you want the ability to report on your sales funnel process? Do you want to show the management and board not only the number of leads at each State, but also the conversion percentages with 100% accuracy? 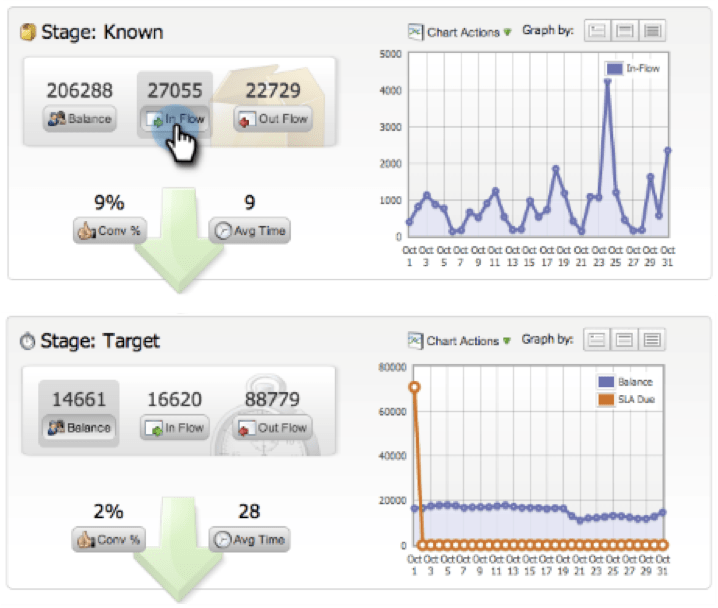 You can with marketing automation! The vision of each marketing automation vendor is to show you the revenue performance of your sales funnel. Sure, as every day marketers we can automate away much of the drudgery of routing leads, choosing content, and deduping. Yet, the vision we work toward is to impact revenue. And to know if we’re impacting revenue, we must have the ability to report on the complete revenue cycle. Sales funnel reporting is the vision your Marketo salesperson gave you during the sales process. The tricky thing is building a system that gets you to that vision. In this post I help you understand the “button” to turn on amazing sales funnel reporting. 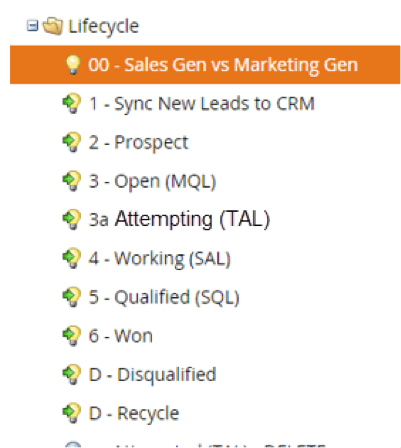 While this post is heavily focused on how to run a lead lifecycle in Marketo, the lessons can apply to any marketing automation platform. Hopefully you are already regularly meeting with your colleagues to discuss the sales and lead lifecycles. At this point, you want to focus on agreement on Stages and when a lead moves between stages. You should also ask hard questions about aligning your process to how Buyers actually think. Sales-marketing alignment is a key step before even implementing a marketing automation platform. The easy (lazy way) is to go with whatever you have been doing in the past. If you do, be sure that this still makes sense for the way you market and sell today and over the next three years. Marketing automation and building an RCM is a catalyst for change – so take action now. These definitions, like a Universal Lead Definition, are required before you continue. Hopefully you are already buddies with Sales and have these defined, but if you are not quite there yet, now is your time. Knowing is Half the Battle – What Is Your Reporting Goal? If you are anything like me, you might play with reporting tools to find the right report. This is a terrible way to setup reporting that will help decisions. Instead, start with your end goal and questions. What questions do you need the answers to? Then, what should that report or chart look like? How fast do leads make it to MQL? How fast do leads make it to Opportunity? 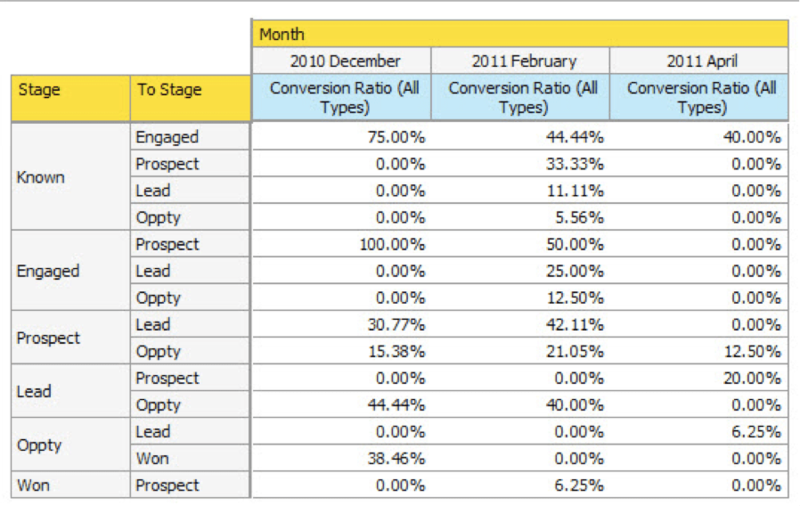 What proportion of leads created in July go from Known to Won? What is our Cost to Acquire a Lead? What is the Cost to Acquire a Won? Is velocity of leads from Known to MQL decreasing or increasing in the past 12 months? What is the average number of touches before someone reaches MQL? Won? Now ask, “Do we have this data? If not, how do we collect it so it can be reported on?” This sort of question can lead to a massive conversation; so for the sake of this post, let’s focus on Sales Funnel Metrics. Take the definitions of Stages and Triggers and map them out. Do this on a whiteboard, with Sales and your managers. Make it excruciatingly clear what will happen at each event. Once you do, take that mobile photo and translate the whiteboard into a process chart using Visio, Draw.io or a similar tool. Again, have details beyond what you think you need. There are two steps to building this draft. Step 1: Convert the flow chart into the RCM draft image. Do whatever you want at this point. There are no consequences in Draft mode. Step 2: Place the transitions and rules into a table like this, preparing for the campaigns you need to drive the Stage changes. 00 – New Lead to Known Lead is CreatedRevenue Stage=AnonymousIs Anonymous=F Change Data Value: Lifecycle Stage=KnownChange Revenue Stage to Known Once This is once because the lead can never go back to Anonymous. Take the table of campaigns and set up a Program with the appropriate smart campaigns inside. This is an example of what it could look like, so do what makes sense for your organization. Map out scenarios involving existing SFDC Leads and SFDC Contacts. Include the MQL fast tracks for free trials or Contact Us forms. Include detours and other exceptions. Make sure you add flow steps to stamp dates of stages. Use the lead lifecycle to also manage your SFDC sync and other necessary data stamping during creation. Testing is a whole other blog post, but do take the time to test. In simpler models with a typical small business or tech startup, the data you have should be fairly simple. Enterprises with multiple objects and different Opportunity Types may find this the most challenging part of the setup. Be sure to get this right so your reports are accurate. Map out basic scenarios such as Known to Won, MQL to Recycle, etc. Create a series of leads with unique email addresses and put them in a grid with the scenarios you plan to use along with the actions you must take in the ideal situation. Make notes on whether the test leads achieved the desired result or if they failed. Once you switch everything on, it takes about 2-3 months before you should rely on the data for decision-making. The reports will spike on day one when you push everyone into the stages. Then you might find you missed a scenario that has to be fixed. Thus, take your time to reach a level of data quality that is reliable for the CMO to present to the Board. Once you have the data, you can report on it, achieving the vision you were sold so many months ago. Here are a few example reports and tips as you go beyond the vision. Marketo’s Success Path Analyzer is one of the visionary lead funnel reports we all like to see. Keep in mind it is only looking at the green “success path” on the RCM. It does take some time for this data to even out. Another type of report is one you extract yourself. Below is a report from data using Program Performance Report and Excel. If you have RCE, you can do so much more, like this report, which is a Model Analysis Report (Lead) with Stage –To Stage attributes. Once you have this data, you can answer some of the questions we posed earlier. Another consideration is to make a decision based on benchmarks, usually from inside the firm, but sometimes outside. Once you have this rolling 12-month average, you can decide if your current month’s data compares favorably or poorly. The next step is to take action. Early on, I caution you to take one action at a time to impact one aspect of the funnel. If you are interested in accelerating the time from Known to MQL, come up with nurturing programs to do just that. Avoid the temptation to pull the other levers all at once, lest you end up with a lot of activity and little to show for it. Perhaps one way to keep your team in check is to remind everyone that success will appear on your resume, while befuddled numbers will be obvious to the next hiring manager. Discover other best practices we’ve developed while working on enterprise Marketo instances, from Lifecycle Processing and Lead Source to intelligently assigning leads to engagement programs with Traffic Director.